James L. Barney was born to Dale and Dorothy (Hudson) Barney in Prineville, Oregon February 27th 1936. 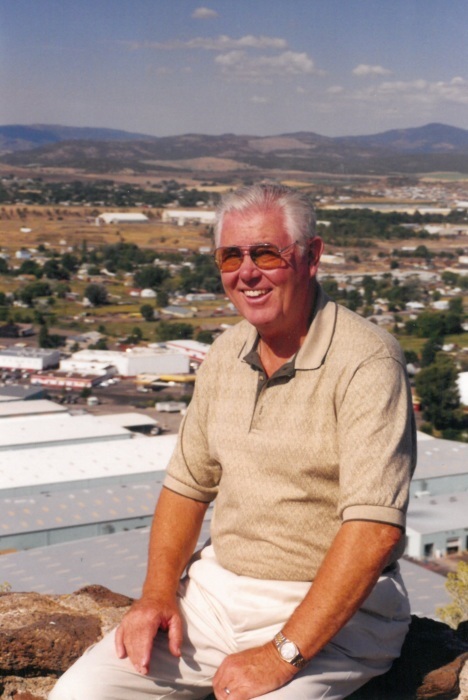 He attended school in Prineville graduating in 1954. Participating in football and choir. He received a scholarship to Washington State University for football and was a Golden Glove Boxer for the Cougars. In 1956 Jim joined the Army and was stationed in France. Upon returning to the US He worked for Firestone Tires in Memphis Tennessee for 3 years. After which he returned to Prineville and began work for Les Schwab, who Jim loved like a father. Jim married Virginia Mink October 4th 1969. They had been married 49 years. As an assistant manager in Spokane Wa. Jim approached Les about opening an affiliate store in Moses Lake Wa. With success there He opened another store in Davenport Wa. and yet another in Ritzville Wa. By 1986 Jim and Virginia wished to retire and sold most assets to Les Schwab, freeing them to spend more time at PGA West in LaQuinta, Ca. While there they were avid golfers and made many fast friends. Jim began collecting golf memorabilia, having the opportunity to meet some of the great golfers of our time, including Arnold Palmer and Tiger Woods. They remained at PGA West until 2015 at which time Jim's health issues brought them back to Prineville. Most of Jim and Virginia's family are in Prineville so it was a blessing for them to return home. Jim is survived by his wife, Virginia. Step-sons; John (Darla) Rhoden and Ron (Sherrie) Rhoden. Grandchildren; Chera, Rhonda, Kristi, JW, Jace, Rita, Jackie, Josh, Jerod, Shane, and Katie. 21 Great-grandchildren, sister, Carol Ann, and nieces Gina and Donna, nephews, Eddie Bennett and John Bennett. Jim was preceded in death by his parents, step-daughters Kathy and Jackie, and sister-in-law Patsy Mink Sullivan. There will be a memorial service at Eastside Church in Prineville Saturday, February 2nd at 11:00. In lieu of flowers the family requests donations be made to Ward Rhoden Scholarship Fund.